The Blue Train is one of the most iconic and luxurious train journeys in the world. It is an overnight journey covering the 1,600km between Cape Town and Johannesburg and Pretoria. Upon leaving Cape Town, the train passes through some stunning scenery in the daylight hours, first the winelands of the Western Cape and then the dramatic semi-desert landscapes of the Great Karoo. On board the Blue Train is the very definition of opulence. Each carriage has a dedicated butler, serving cabins featuring twin or double beds with finest linen and en suite bathrooms with a bath or shower, complete with marble tiles and gold fittings. The train also features a lounge car with bar, library and big screen television and a dining car with full silver service. Sumptuous local cuisine is served with award-winning South African wines and formal dress code is expected. 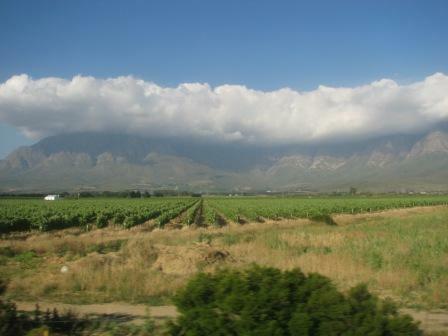 The Trans-Karoo Train is operated on the same route by the Shosholoza Meyl company but is a standard working service lacking the luxury of the Blue Train. However it is a much more affordable option and a more authentic African experience where you will be travelling mostly with locals, as well as offering the same picturesque vistas en route. There is the option of 1st or 2nd class sleeper cars or 3rd class seating as well as a dining car where the dress code is casual! 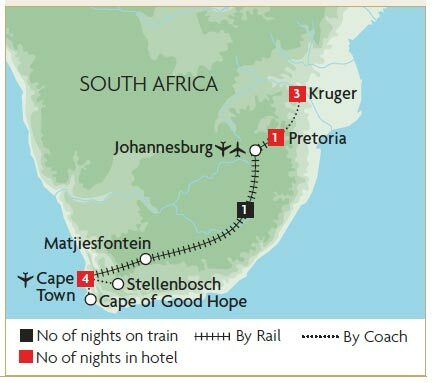 Experience some of South Africa's true highlights and travel from Cape Town to Pretoria on the famous Blue Train - one of the world's truly iconic luxury rail journeys. Complete the adventure with a stay at a private game lodge in legendary Kruger National Park.